With the Miami skyline to her back, a statue of La Caridad del Cobre is taken from her shrine in Coconut Grove for a symbolic ride on the waters of Biscayne Bay. In preparation of a major celebration planned in her honor next week, the statue of Our Lady of Charity was taken from her popular Coconut Grove shrine on Sunday for her traditional boat ride on Biscayne Bay. Leading a flotilla of her followers, Cuba’s patron saint traveled in a bed of flowers with part of the downtown Miami skyline to her back. The annual event is known as the Pilgrimage of the Virgin and comes a week before her day is celebrated every September 8th. 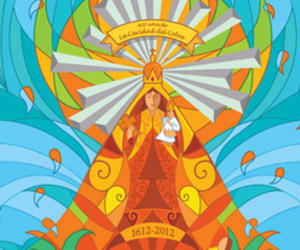 The virgin, known as La Caridad del Cobre, traveled on her vessel to Miami city hall, where she was met by dignitaries. The statue was then taken to the mouth of the Miami River for a special convocation in honor of Cuba. Next Saturday, Miami’s Cuban Catholic community is planning a large celebration to mark the 400th anniversary of the discovery of her statue by three fishermen bracing a storm in Cuba’s Bay of Nipe. The pope’s visit to Cuba earlier this year was also in her honor. The Archdiocese of Miami is inviting the faithful to attend the free celebration at the AmericanAirlines Arena, which has been rented fro the event. The festivities begin at 4 p.m. with the departure of the statute from her shrine again via the bay, headed to the arena. The statute is scheduled to arrive at the event at 5 p.m. Before she enters the arena, a prayer will be said for a free Cuba in front of the Freedom Tower across the street. A 6 p.m. Mass will be led by Miami Archbishop Thomas Wenski. A concert will follow at 8:15 p.m.